Jaded Blossom: Happy 1st Day of School! Hello everyone! This is Cassandra from Creating with Color by Cassandra. With everyone going back to school this time of year, I decided to make a fun project for the kiddos. Hee! I wish I had something like this on my first day of school! ;) To decorate each pencil, I used the Jaded Blossom ~ Treat Flags. For the sentiments on all of the flags, I used the Jaded Blossom ~ School Rules, the Jaded Blossom ~ Lunch Box Notes 2, the Jaded Blossom ~ Dream In Color, and the Jaded Blossom ~ Super Hero. For the large tag on the holder, I used the Jaded Blossom ~ Treat Tag Die. The smaller tag is cut with the Jaded Blossom ~ Mini Tag Dies 2. And the sentiment is from the Jaded Blossom ~ Lunch Box Notes 2. The super fun apple is from the SVG Cutting Files ~ Kawaii Nerdy School. This is so fun! I just love how you jazzed up the pencils! Omg, this is adorable! So stinken cute:) I love the fun tags on the pencils~the tag is fabulous! Super cuteness! 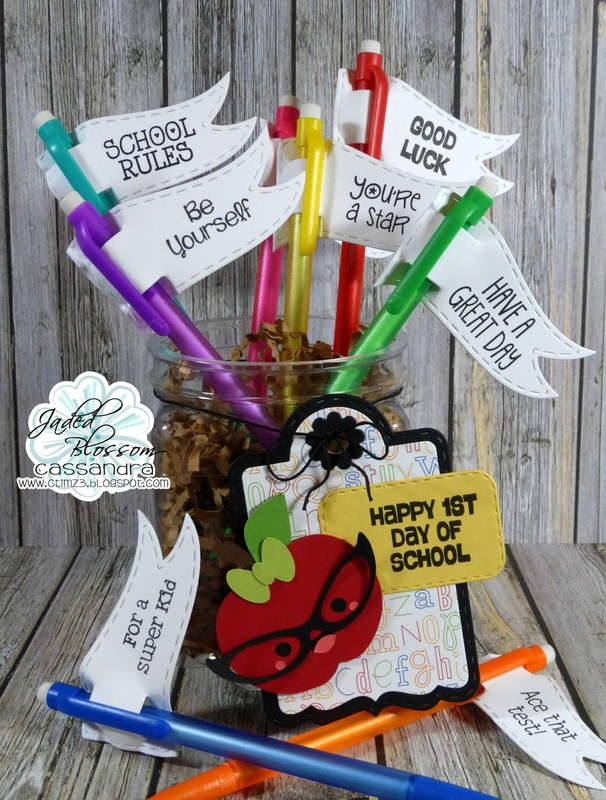 Love the flags, great idea for back to school!